Principal Cast : Dane Cook, Stacey Keach, Danny Mann, Priyanka Chopra, Brad Garrett, Teri Hatcher, Cedric The Entertainer, Julia Louis-Dreyfuss, Roger Craig Smith, Gabriel Iglesias, John Cleese, Carlos Alazraqui, Val Kilmer, Anthony Edwards, Sinbad, Oliver Kalkofe. Synopsis: Cropdusting plane Dusty dreams of racing in the Wings Across The World, and ends up competing thanks to the help of his friends. Racing against the odds, Dusty goes up against incredible odds, and his own failings, in order to try and win the race. What we think : Middle-ground animated film offers absolutely nothing new in the realm of story, although what it lacks in creative zip in narrative, it more than accomplishes from some terrific animation. Still, you know what they say about beauty being only skin deep: Planes is superficial and superfluous, offering nothing but a simple sugar rush that wanes as quickly as it arrives. It’s a telling thing about Planes that it was originally designed as a direct-to-DVD release, until somebody at Disney decided to give the film a full-fledged cinematic release. Telling, because you can see the by-the-numbers characters and plot coming a mile off in this semi-sequel to Pixar’s Cars franchise. 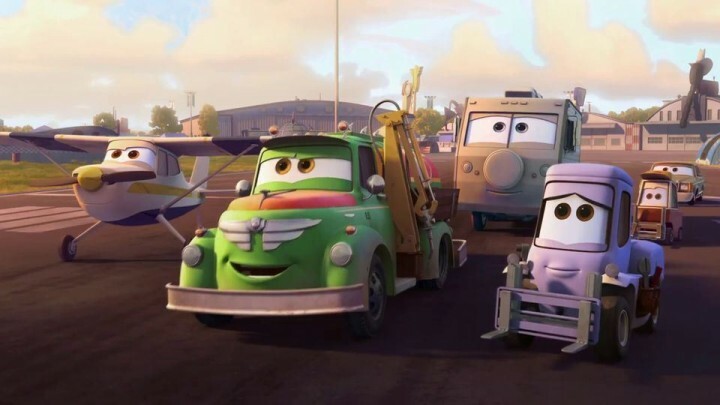 Cars, and it’s sequel, weren’t (and still aren’t) met with the greatest critical reception from the public, and remain among the “lesser” of Pixar’s stable of stars – Planes, as the title might intimate, is set within the world of Cars, although this one focuses primarily on the airborne variety of character. 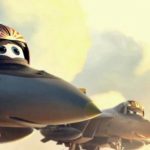 Much like its Pixar-borne brethren, Planes (actually animated under the Disneytoons banner, by Pixar’s parent company) is driven (ha!) by a fairly rote set of characters, and an enormously predictable plot, coupled with a not-quite-A-List voice roster that, in reflection, cribs almost note for note from the Cars franchise (especially the original). Leaving with a jet plane. Dusty Crophopper (Dane Cook) is a cropduster plane who dreams of becoming a world famous racer, all whilst dusting crops and practicing his aerial maneuvers. His dreams are ridiculed by his boss (Cedric The Entertainer), his mechanic forklift Dottie (Teri Hatcher), and by reclusive navy plane Skipper (Stacy Keach), while Dusty’s fuel truck friend Chug (Brad Garrett) supports him. 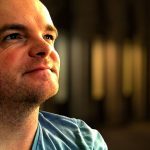 After winning a place in the hugely popular trans-continental race, Wings Around The World, through another competitor being disqualified, Dusty is regarded as simply making up the numbers. However, through tenacity and being a friend to several of his competitors – namely a Mexican plane named El Chupacabra (Carlos Alzariqui), an Indian racer named Ishani (Priyanka Chopra), and a British de Havilland Comet named Bulldog (John Cleese), Dusty manages to make his way through the various stages of the race. His main rival, a custom race plane named Ripslinger (Roger Craig Smith), is intent on winning the race for a record fourth consecutive time, and, along with his bully-boys Rip and Zip (Gabriel Igelisas), tries to win at any cost. As Dusty races through a variety of terrain, he is guided by his “wingman” in Skipper, whose naval experience allows the cropduster to navigate some truly treacherous moments of the race. 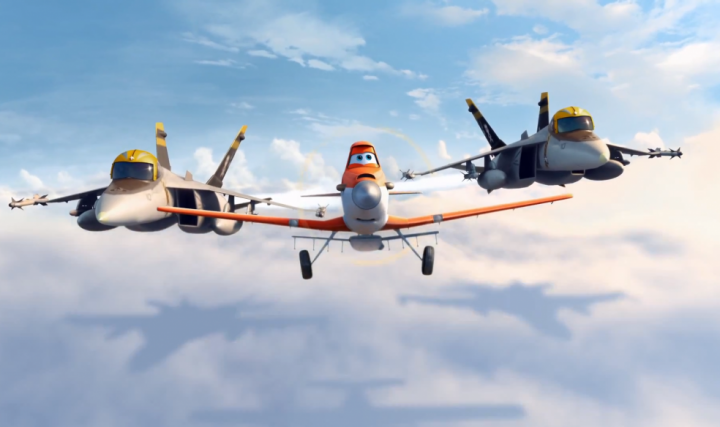 Planes runs the gamut of almost every kids-flick cliche imaginable. From the “believe in yourself” mantra, the “you can achieve anything if you have friends” warm-huggys, to the predictable and unsatisfying photo-finish finale, Planes never once soars into the upper atmosphere of creativity or invention. It’s a story so predictable you know how it’s going to end almost from frame one. Dusty, dreaming of being a racer – and you know he’ll make it into a race, and, like fellow 2013 animated flick Turbo, thrust its lead character into a series of “character building” scenarios that take only the most intellectually stunted people on any kind of emotional journey – has his friends, and is a likeable fellow. He’s altruistic to a fault, always willing to help others even at the expense of his own dreams, and you can see the “aww shucks” moments coming later on when his one-time rivals slowly become his friends and allies. Tick all the boxes of genre emotional tags, from Skipper’s hidden secret about his “naval experience”, to love-interest Ishani’s inevitable betrayal of Dusty before they reconcile, and even to the Big Happy Family finale, Planes never reaches the heights to which it so obviously aspires. 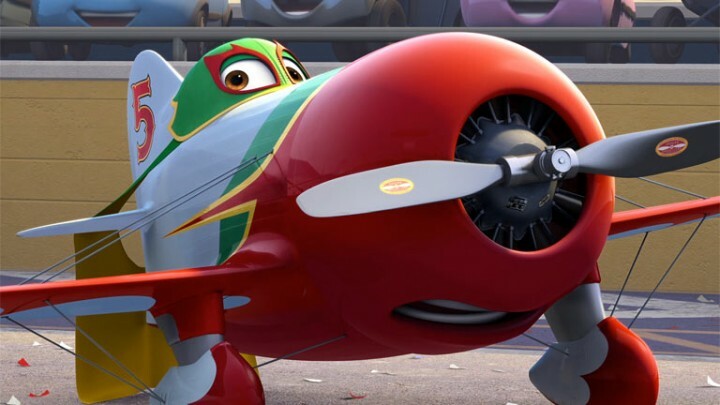 As a story, Planes is as generic, as unoriginal, as unimpressive, as you’re likely to find. Don’t argue with me boy, I have bigger wings than you. The film’s more impressive aspect is in its animation, and I’m hard pressed to give the film anything other than an A+ for technical prowess. 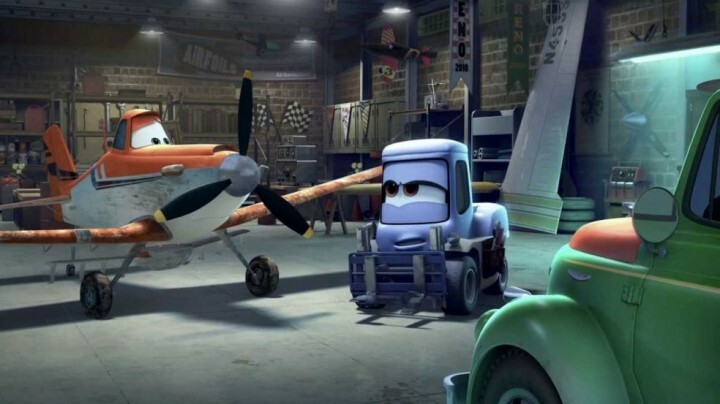 Filled with some dynamic, exciting and occasionally thrilling racing animation, and featuring the same production design behind the Cars franchise (windscreens have eyes, forklifts become the blue-collar workers of this movie), Planes has a visceral aero-visual flavor that makes me ache for a truly captivating story in which it could work. 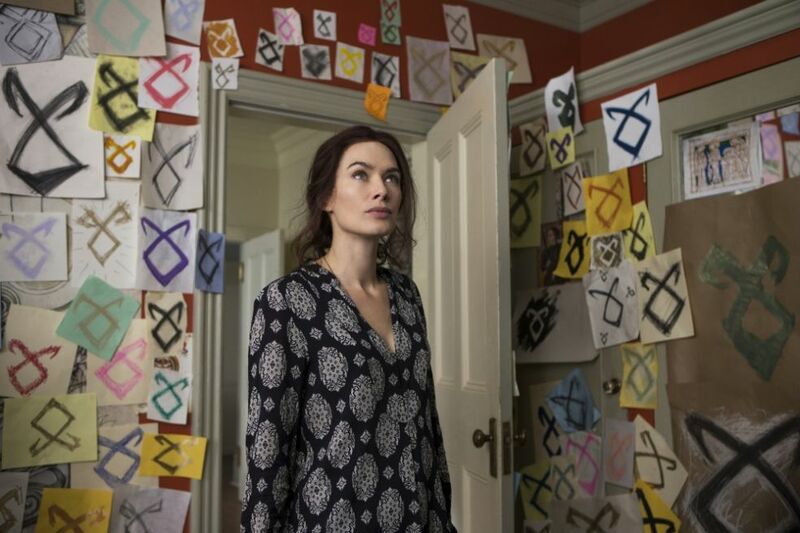 Unfortunately, the story lets everything down badly, making this film one which will dazzle small kids, but bore the more discerning rather quickly. Mark Macina’s pulsating score is evocative, thunderous and epic when required, counterpointed by smaller, more comedic intimacy when the characters interact through dramatic means. Mancina is a composer I’ve admired for a while, and although the film is better for his input, I doubt this score will be high on the list of eventual montage work come Oscar time. Klay Hall, who directed Disney’s Tinker Bell & The Lost Treasure prior to snagging this effort, does as good a job as he can considering how low-brow the story is, driving a lot of the films energy through the blistering and (I admit) exciting action sequences. He’s thrown everything into this film (except a good story, although I guess you could argue he’s thrown about three hundred stories into this one film to get what he’s got! ), including a nod to classic flight-flick Top Gun, in the casting of Val Kilmer and Anthony Edwards as a couple of modern Navy jets who find Dusty running out of fuel over the Pacific. Who is this Nacho Libre you speak of? The majority of the voice cast, especially Dane Cook’s Dusty, feels like a rehash outright of Cars. Cook’s Dusty might as well be Owen Wilson’s Lightning McQueen, right down to his hoedown-farmhand vocal accent, while Ishani’s sensual vocals appear rather similar to Bonnie Hunt’s Sally (McQueen’s love interest), and Brad Garrett’s dimwitted Chug might as well be the twin brother of Larry The Cable Guy’s Mater. Skipper, voiced by perennial film Bad Guy Stacey Keach, is the curmudgeonly, deep-voiced husky mentor to Dusty, echoing Paul Newman’s Doc Hudson, and Roger Craig Smith’s nasty Ripslinger is an airborne carbon copy of Michael Keaton’s Chick Hicks, in that neither of them will stop until they win the race, at any cost. There are far too many parallels between Planes and Cars to make me think anybody even gave a crap at the writing table; its terrible how cynical I feel about this film, but the facts are the facts – Planes is a lesser film for trying to copy a better film (and there’s not to many examples where you’d claim Cars is a better film!) and even on its own, can’t hold up under scrutiny. The end credits indicate a sequel is coming (and it is), and Planes is apparently the first in a trilogy, although were a sequel to be as lackluster and ineptly made as, one would say a trilogy might not pan out. Planes is definitely middle-ground fare, lacking heart and soul, and any kind of creativity (other than to steal outright the plot of other, better animated films); while it’s not boring, it’s not exactly stimulating either. 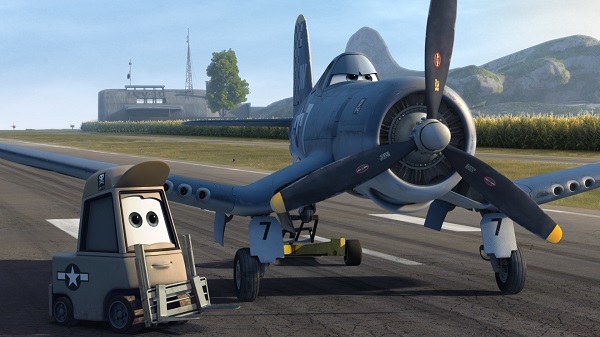 Aside from some terrific animation, Planes struggles with mediocrity, and never becomes a film in its own right. It spends too much time basking in the shadows of others. Skipped this and for good reason it seems. If you have kids who are into Cars though this is probably not one you will be able to escape. Yeah, you'll get to see it eventually if you have kids. Probably more than once, I'd wager. It's not a keeper, that's for sure. LOL that's a good one mate! I'm gonna use that at some point! !